After dinner, I walked in the busy Shinjuku and feeling quite excited in a chilly night like this, and thinking how amazing it is to be feeling so alive in a foreign country. The race was about 12 hours away, and I again reminded myself that tomorrow I would go out there and enjoy the whole race experience without worrying about my time. Got back to my room and laid-out my GU shirt, tights, arm sleeves, gloves, the new Tokyo Marathon hat I bought at the Expo, and 5 x GU Roctane, and my iPhone. Made sure I tied the timing chip correctly to my shoe laces, and set the alarm to 7:15am for the next day. Got up promptly and ate the an-pan (red bean bread) that I bought from the FamilyMart across street, too bad that I did not find anything at the Anderson Bakery the day before. Took a quick hot shower and put on my race clothing and pined the bib to my shirt, “time to go Michele!! 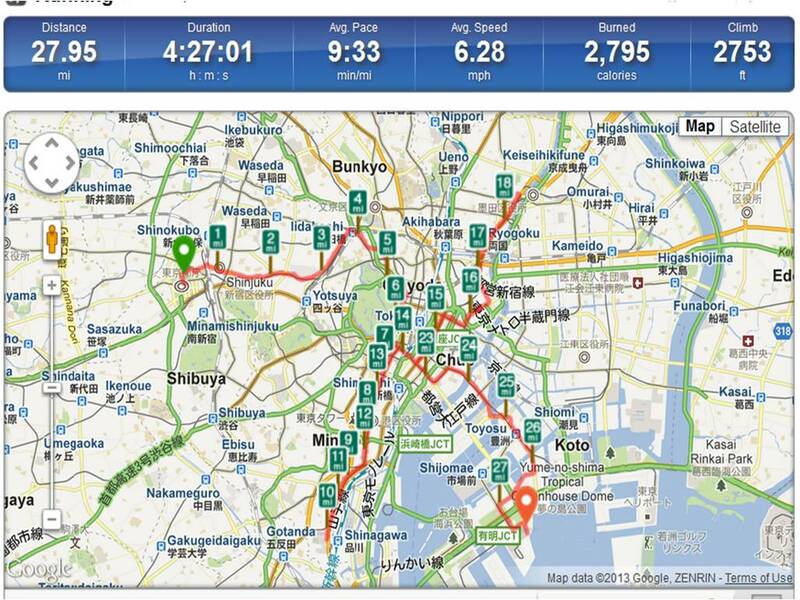 !” The race starts at Metropolitan Government Building and was about 10 mins walk from my hotel, and as I navigating through the underground I recognized the turns and stairs from last year. Honestly speaking, I have missed my friend a great deal (or maybe not friend anymore) during this trip, and especially at moment like this. I surfaced up the streets and walked toward to Hyatt and bag-drop area, and looked for Mike, Marco and Kiyoshi. This is the same corner I had come last year, and today I feel like I am on a mission to run away from memory and attachments. More and more runners coming in to the blocked area, and Kiyoshi and I simply could not find Mike and Marco in the crowd even though they should be so easy to spot. Around 8:30am I gave up looking for them for I needed to drop off my bag and walked to my block/corral. There were many trucks lineup served as gear check/bag drop, and volunteers were standing in front of the trucks to accept our bags. I took a picture with the volunteer and she flashed a huge smile and told me “Gambatte”, so cute!! I decided that I would take picture with every volunteers that I come to meet today! Walking to my designate E block was a huge challenge though for I needed to go to the upper platform. Last year I parted with Max at the corner of Hyatt and had no problem at all to get to my block, but this time I had to climb stairs to upper platform and it’s terribly congested. Amazed to see how Japanese waited calmly and patiently, and no one fussed about this frustrating situation. I chatted with a guy from Denmark as we slowly moving up with the crowds. The first couple miles were all downhill and many runners tend to go very fast with the sheer race day excitement, and I really had to try in order to keep my pace above 9:00 min pace while enjoying the energy from the crowd and view of Gyoen Garden. After crossing the first 5km check point, the course started to be flat and first aid-station came up. I stopped for some water and took a picture with the volunteer who was filling water into cups with gloved hands! No worry about contaminated water or food at Tokyo Marathon for sure! Making a right turn at Lidabashi, and I had learned that “bashi” means “bridge” which came up many times on this course; saw kendo practice demonstration and it was so cool. From mile 4 to 6 the course was in the very nice Chiyoda-ku where I ran pass Yosakoi dance performance, and love the unique cultural experience while running a marathon. The view of Museum of Modern Art and Imperial Palace Garden was beautiful and I was so happy to run pass it again, and no sad feeling this time. When I saw the Imperial Guard Band playing, I was thinking that they looked way too serious :-p. At Hibiya Park, the course made a right turn approaching the 10km check point and second aid-station, at this time my pace was a little below 9:00 min pace with my stops at the aid-stations and taking pictures. I started seeing elite runners running on the other side of the course, and when second pack of fast runners dashing by it’s truly awesome to see many fast Japanese runners which don’t get to see often at races back in U.S. There were cheering dance performed by high school girls which I am not a huge fan, but the Taiko Drum performance near the Shiba Park was stunning and energizing! More cheering dance and this time were by adorable little children, kawaii 🙂 Course became narrower and passed Sengakuji Temple, and the 15KM check point was ahead now. 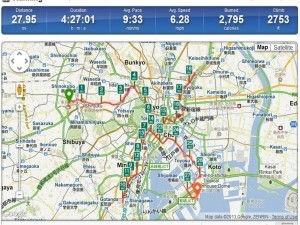 Made a U-turn at 15km and running pass more dancing groups, and so glad to see beautiful sight of Shiba Park and Tokyo Tower!! After the 20km check point, I wondered what I would see at the aid-station ahead of me? I was looking forward to the an-pan and magic banana. Also realized that the Halfway Point should be coming up soon, and immediately I had image of that familiar smile in my head that I haven’t seen for a long time, standing on the left with camera among all the Japanese spectators. When I made that right turn, I could not help but looked again and of course I was disappointed. But what do you expect? I asked myself. Not sure what I was trying to prove or what I was running away from, but I ran the fastest split from the Halfway Point and wanting to have my PR so badly now. I wanted to race myself and of course that was never the original plan. I started thinking to skip aid-stations and stop taking break for pictures with volunteers, so I might be able to slash few minutes off, and the plan to enjoy the race and have fun got completely forgotten. Of course now I can see those mental calculations and changing of race goal weren’t very wise, but when there is a bib pined to my shirt I do silly things. So I did my silly things from mile 14 to mile 20, and I paid less attention to how great the spectators or landmarks were. Instead I was getting annoyed with all the “bashis” – Nihombashi, Azumabashi, Hamacho Nakanobahshi…etc, and dislike so many turns and wondered why the course was so narrow and congested when coming up to the Sensoji Temple. And a bit before the 35km check point, I experienced a sudden dizziness that I had never experienced before at any race. I was shocked and a bit scared also, what’s going on? Then the worse happened – muscle cramps on both legs, my quads tighten up and I was in so much pain that I could not run near the Irifunebashi. I had calves cramp up before, and I knew how to walk it off, but quads? This is completely new! I had to walk a bit and hoping the pain would go away and wanting to loosen up the tight muscle. So from 35km and onward I had to do run/walk and my pace totally got toasted. When I had to walk on the Harumibashi, I was mad at myself for the hike yesterday, for not having banana as part of race day breakfast routine, and for skipping aid-stations today. When I saw the Bay and open water I felt a little better, and I thought about what a big difference as far as race goes. Last year I was feeling so strong and happy at this point, and this year I am experiencing muscle cramps and pissed at myself. But I can’t let this beat me or break me down though, I knew PR would not happen now but should run the remaining of race with strong effort. So mentally I reset the whole thing and told myself that the race starts from here, from now!! And could not have picked a better timing, the Taiko Drums performance around 40km check point really lifted my spirit, arigato!! My quads still hurt, and for the first time at a race I could not sprint toward the finish. But nevertheless I ran toward the Finish and pushed myself to beat the Seiko timing clock! After crossing the finish line, I received the nice Tokyo Marathon Finisher towel from the volunteer, along with water, banana, medal…etc; I continued walking to the bag retrieving area thinking that no one would be waiting for me or giving me a big hug today. There were mixed feelings of disappointment and depression –understandably I was disappointed that the race did not go well, and I did not improve my time from last year. I felt so ashamed!! But am I glad that that I came, ran and finished Tokyo Marathon? You bet!! Even the race did not go as I have hoped for, but I was happy to be among all 36,000 runners from all over the world, and especially so grateful for the great support of all the volunteers in Tokyo! 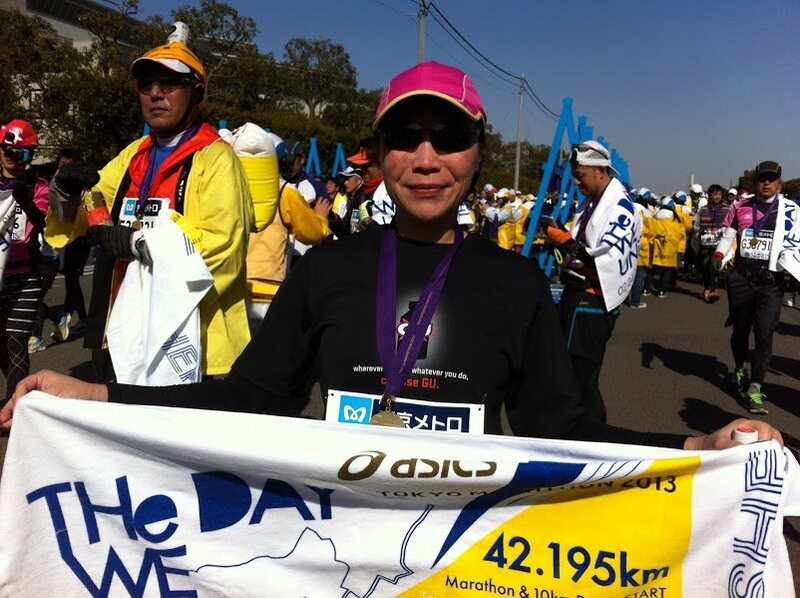 Sunday, Feb 24th, 2013, 1:43pm, 27.95ml, 4:26 — I completed Tokyo Marathon 2013.